360 PR supports many organizations in the communities where our employees live and beyond. One of the things we look forward to each year is our holiday giving campaign. This year, in addition to giving time and money, we are dedicating our social channels to help raise awareness of three organizations providing food, clothing and shelter to those in need: Share Our Strength (a 360 PR client) and their No Child Hungry campaign; New York Cares, whose annual Coat Drive provides warm coats to people who would otherwise face winter without one, including the thousands impacted by Hurricane Sandy this year; and The Home for Little Wanderers, a change agent in the field of child welfare. Members of 360 PR's Digital Team created a Facebook page takeover, several tabs, and a month-long content calendar to engage and educate fans about each organization. 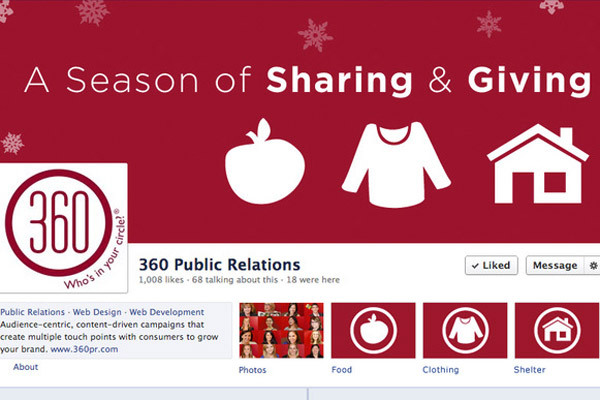 The effort will extend to Twitter (Twitter/360PR) and Pinterest (360PRpins) as well. All 360 PR employees in Boston and New York will participate in the effort, sharing facts and conversations about No Kid Hungry, New York Cares, and The Home for Little Wanderers with friends and family. The agency will also make a donation to each organization on behalf of employees, clients, and partners.